Together with Search, Koopman-works compiled a survey for the CBI, focussed on if and how the Moldovan textile industry can benefit from Diagonal cumulation. The study was published October 2012. The Moldovan apparel industry is a major export sector of the country (an estimated turnover of €151 mln in 2011, 1.8% of GDP). The most important export destinations for Moldovan apparel producers are EU countries. The combination of a growing demand for fast fashion, sustainable fashion, proximity to the EU market, low wages and flexibility offers good prospects for increasing the Moldovan apparel exports to the EU even further. Price and lead-time remains one of the most important selling points. However producers face a problem when they use Turkisch fabrics and export to Europe. Normally manufacturers can export importduty free to Europe (with Euro-1). But this is not valid when they use Turkisch fabrics. 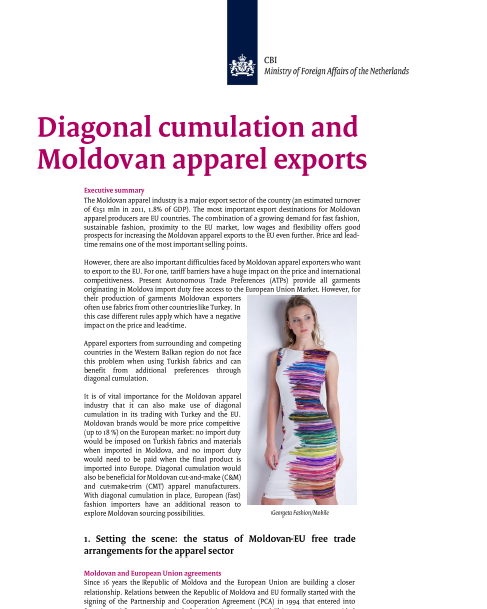 This study highlights the benefits for the Moldovan textile and garment industry when Diagonal Cumulation would be in place. Here you can find the full survey. In case you encounter problems pls do not hesitate to contact me.